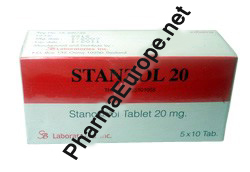 Male athletes who have access to the injectable Winstrol Depot usually prefer that to the tablet due to dosage issues. Women often prefer oral Winstrol. This makes sense since female athletes have a distinctly lower daily requirement of stanozolol, usually 10-16 mg/day. Another reason for the oral intake in women is that the dosage to be taken can be divided into equal doses. This has the advantage that unlike the 50 mg injections, it does not lead to a significant increase in the androgens and virilization symptoms are reduced. Athletes who have opted for the oral administration of Winstrol usually take their daily dose in two equal amounts mornings and evenings with some liquid during their meals. This assures a good absorption of the substance and, at the same time, minimizes possible gastrointestinal pain.